Logic Shipping and Trading can offer warehousing logistics solutions especially tailored to your needs. 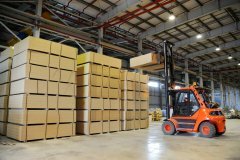 We have access to strategically placed warehouses worldwide and can provide you with optimal locations for your distrubution needs. We are able to handle most cargo configurations, be they perishable items that need proper cold storage facilities or dangerous goods where special safety concerns have to be taken into consideration. For imported goods for which import duty is yet to be paid we also have access to bonded warehouses in many ports where cargo can be placed until the duty has been paid. We have extensive experience in the use of transshipment and transloading warehouses where cargo from different manufacturers is stored in short periods between their transfer from one means of transportation to another. This typically involves pickup and delivery of cargo at a warehouse using trailers with later reloading into containers for further transport by sea to final receiver. A solution that is both cost and time efficient.